MINI owners can appreciate value, quality, exceptional handling and FUN! MINI USA uses the term motoring when describing the driving experience of a MINI. You love your MINI and want the best care possible- we can help! Our team of knowledgeable Service Advisors and Certified Master Technicians will take care of all your service, maintenance, and repairs to keep your MINI just the way you like it. We can work on your Countryman, Clubman, hardtops, and convertibles. No matter which model you own, we can service it. The iAUTOHAUS repair facility is ultra clean, and it is outfitted with the latest diagnostic tools and equipment. iAUTOHAUS only uses quality factory or OEM parts, and we always offer a 24 month/24,000-mile labor and parts warranty. Our Certified Master Technicians have over 100 years of accumulated repair experience, and you can count on fair pricing! 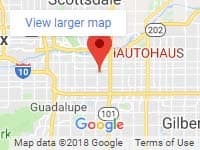 Easily reachable from all the east valley, Scottsdale, Tempe, Chandler, Gilbert, Phoenix and Mesa we can start to work on your MINI very quickly. Ready for a different MINI? We have an excellent selection of Pre-Owned MINIS that you can choose from while browsing our comfortable, indoor showroom. We also feature an impressive inventory of luxury and high-performance European cars at many different price points. We have financing available and extended warranties to give you additional peace-of-mind. Our sales team is here to help make your purchase process easy and enjoyable! iAUTOHAUS is family owned and operated, and we look forward to an opportunity to earn your business.